Busenberg is a municipality in Südwestpfalz district, in Rhineland-Palatinate, western Germany. 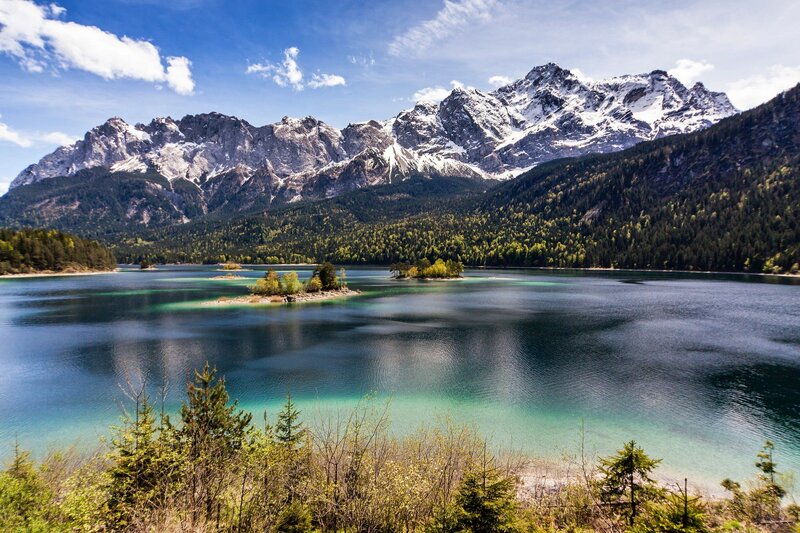 Eibsee is a lake in Bavaria, Germany, 9 km southwest of Garmisch-Partenkirchen and roughly 100 km southwest of Munich. At an elevation of 973.28 m, its surface area is 177.4 ha. 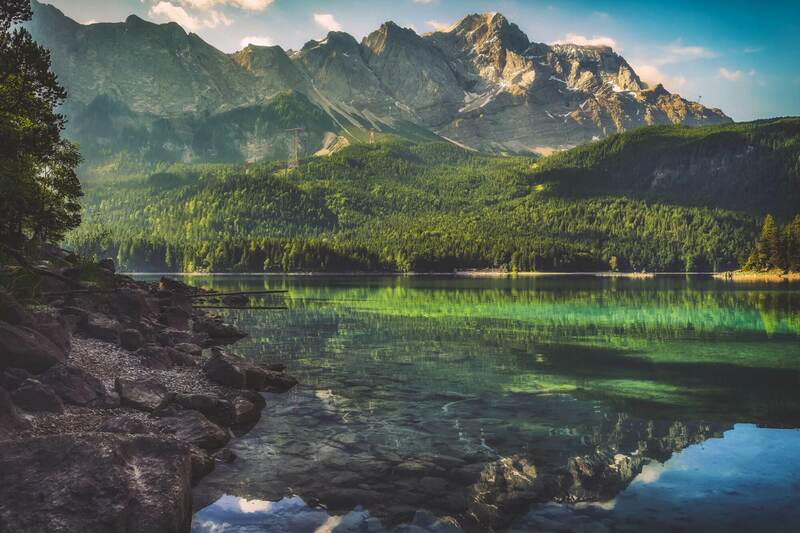 Eibsee lies at the base of the Zugspitze (2950 meters above sea level), Germany's highest mountain. As of May 2010, trains from Munich to Garmisch-Partenkirchen leave roughly once an hour and the trip takes about an hour and a half. Buses travel regularly from the train station in Garmisch-Partenkirchen to Eibsee. A valid train ticket can often be used to ride the bus. 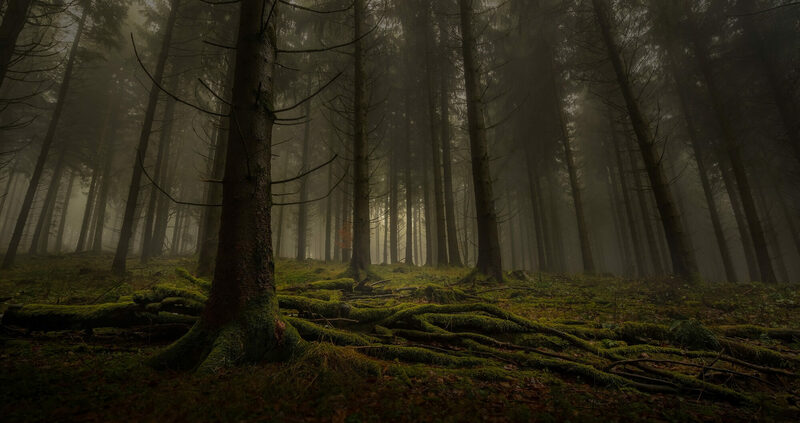 The Herzogstand is a mountain in the Bavarian foothills of the Alps, 75 kilometres (47 mi) south of the city of Munich. It has an elevation of 1,731 metres (5,679 ft) and is northwest of Lake Walchen. Maximilian II of Bavaria had a hunting lodge built underneath today's so-called Herzogstand-house in 1857. His successor, King Ludwig II, had a royal lodge built further up the mountain in 1865. The Herzogstand Aerial Tramway, renewed in 1994 following a fire in 1992, runs to Herzogstand-house at 1,575 metres (5,167 ft) above sea level, and then continues on to the summit of Farnkopf at 1,627 metres (5,338 ft). The most popular ascent (AV way 446) leads from the valley station of the aerial tramway across the south side to Herzogstand-house and on to the summit of the mountain. An alternative descent leads along the somewhat exposed but well-secured ridge to the Heimgarten mountain (1,790 metres/5,870 ft), passing a lodge to the south of the Ohlstaedter Alm (1,423 metres/4,669 ft). The descent east of the Rotwandkopf continues down to the spa town of Walchensee. Berchtesgadener Land is a district in Bavaria, Germany. It is bounded by the district of Traunstein and by the state of Austria. 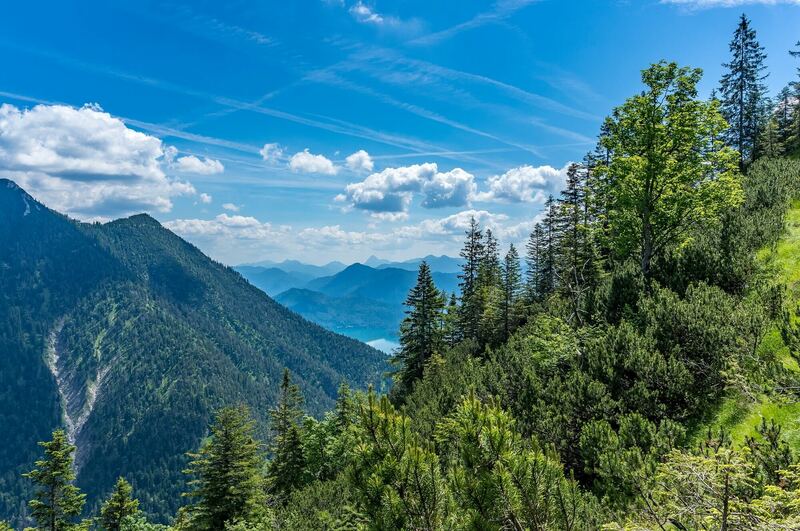 The alpine regions of the south were Bavarian territory from the early Middle Ages. The 11th and 12th centuries saw the founding of numerous mountain villages. One of these settlements was Berchtesgaden, which later assumed a more dominant role in the administrative district that now bears its name. The northern portion of the Salzach river valley was traditionally part of bishopric (principality) of Salzburg. This principality functioned as a buffer state between Bavaria and Austria until the early 19th century. In 1816 it was divided along the Salzach river and then split between Bavaria and Austria. The western half of the former principality of Salzburg is today part of the district of Berchtesgadener Land. The Königssee is a natural lake in the extreme southeast Berchtesgadener Land district of the German state of Bavaria, near the Austrian border. Most of the lake is within the Berchtesgaden National Park. Situated within the Berchtesgaden Alps in the municipality of Schönau am Königsee, just south of Berchtesgaden and the Austrian city of Salzburg, the Königssee is Germany's third deepest lake. Located at a Jurassic rift, it was formed by glaciers during the last ice age. It stretches about 7.7 km (4.8 mi) in the north-south direction and is about 1.7 km (1.1 mi) across at its widest point. Except at its outlet, the Königsseer Ache at the village of Königssee, the lake similar to a fjord is surrounded by steeply rising flanks of mountains up to 2,700 m (8,900 ft), including the Watzmann massif in the west. The railway Königsseebahn served the lake from 1909 until 1965. Its last tracks were dismantled during 1971, and the station in Berchtesgaden was demolished in 2012. The only remaining element of the railway is the Königsee station (now a restaurant). The track route is mostly used as a walking path. 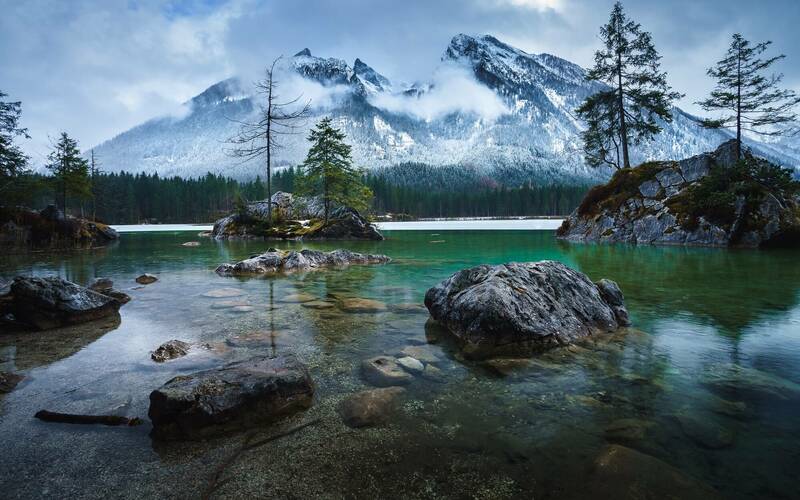 The literal translation of the name, Königssee, appears to be "king's lake"; however while German: König does indeed mean "king", there had been no Bavarian kings since the days of Louis the German until Elector Maximilian I Joseph assumed the royal title in 1806. 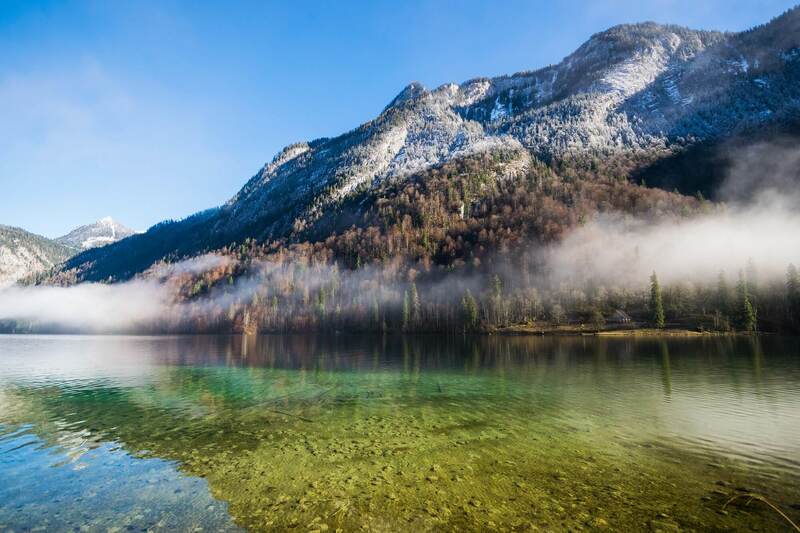 Therefore, the name more probably stems from the first name Kuno of local nobles, who appear in several historical sources referring to the donation of the Berchtesgaden Provostry in the twelfth century; the lake was formerly called Kunigsee. Hohenfels is a municipality in Konstanz district, in Baden-Württemberg, Germany. The municipal area is located north of Lake Constance on the eastern rim of the Hegau region, about 8 km (5.0 mi) east of Stockach. It includes the villages of Deutwang, Kalkofen, Liggersdorf, Mindersdorf, and Selgetsweiler. In 1352 the Swabian lordship of Hohenfels around the 12th century New Hohenfels Castle was inherited by the noble House of Jungingen. Konrad von Jungingen (c. 1355–1407) and his brother Ulrich (1360–1410) served as Grand Masters of the Teutonic Knights; in 1506 the Teutonic Order purchased the Lordship of Hohenfels, which became part of the Altshausen commandry within the Alsace-Burgundy bailiwick. Saxon Switzerland (German: Sächsische Schweiz) is a hilly climbing area and national park around the Elbe valley south-east of Dresden in Saxony, Germany. 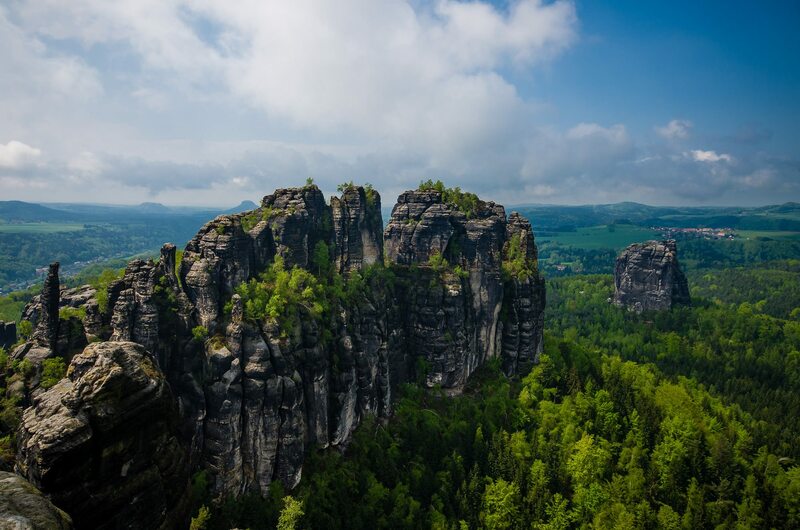 Together with the Bohemian Switzerland in the Czech Republic it forms the Elbe Sandstone Mountains. 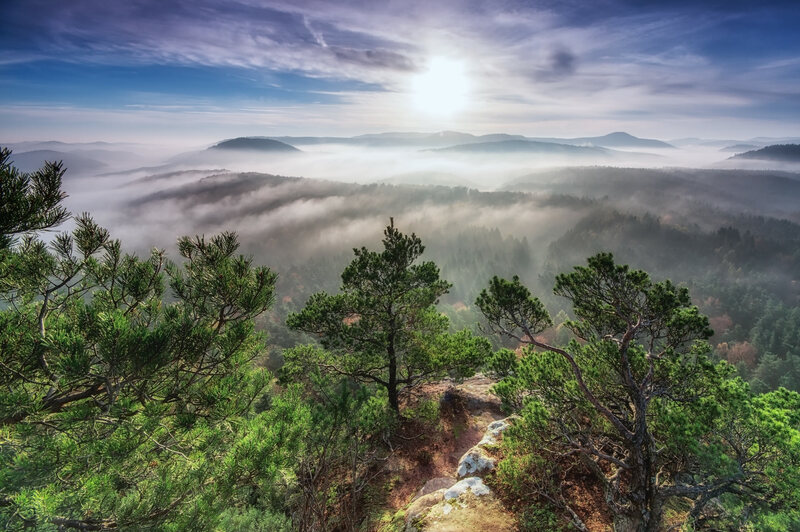 Saxon Switzerland alone has some 1,000 climbing peaks, as well as several hollows. The area is popular with Dresden locals and international climbers. The administrative district for the area is Sächsische Schweiz-Osterzgebirge. The fortress of Königstein is a well-known landmark.